This homeopathic remedy is useful in Alzheimer’s, Autism, ADHD, PANDAS and other neurological disorders, along with other important polychrests. Strabismus. Strabismus has been observed in some cases, and the pupils are dilated. Scorpion stings are attended with a certain amount of danger, especially to children. Bitten part much swollen, with violent pains lasting from one to three days. Pain and swelling of the injured part are first experienced, and constitutional symptoms follow. Heat and pain at bitten spot, sleepiness, sneezing, restlessness, later, abundant saliva, meteorism, later, trismus or tetanus. Always acute pains in and diminished temperature of the part bitten. 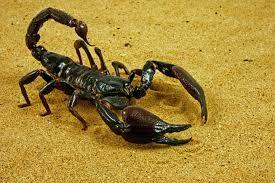 Scorpions live under rocks and sting their prey to death by sudden attack. This remedy is used for children with ADHD whose parents fear them because they are violent, disruptive and stir up trouble where ever they go. Scorpion is used for children who are violent if provoked or just for the fun of it. Used for children who lack conscience and compassion for the suffering of others. Indifferent to pain or pleasure. Scorpion remedy is used for impossible kids who can‘t learn and are disruptive. There can be genetic damage, from one of the parents being stung by a scorpion. These children can be extremely violent, hurting others just for the fun of it. They can be mean without any conscience. Parents of these children often fear bodily harm from Scorpion children or that they are headed for a life of violent crime. The children are detached, like to be alone. Indifferent to pleasure or pain, to others opinion of them or to responsibility. They feel removed from the demands of society. They live in a self imposed isolation where they build up a store of hatred. They view the world as if they are looking at it through a hole in the rocks. Their minds go blank when concentrating and can’t think of more than one thing at a time.